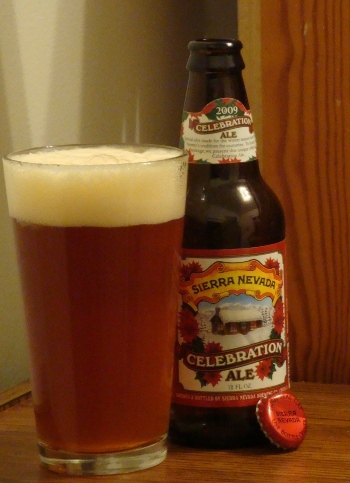 Tonight I will be tasting the 2009 Celebration Ale from Sierra Nevada Brewing Company in Chico, California. This is the newest in Sierra Nevada’s venerated line of hoppy winter beers. The 2009 Celebration Ale pours a golden amber with a healthy bottle-condition haze. The tan head is absurdly thick and creamy, like meringue. The nose is richly hoppy. A tart grapefruit aroma prevails, accompanied by lemongrass and pineapple. A hint of malty sweetness comes through, but the grapefruit makes it difficult to detect. The flavor of the Celebration Ale is supremely hoppy. Grapefruit dominates, to a fault. Almost nothing else is noticeable besides, even the bitterness from those hops. The tart citric flavor seems a bit flat, and is refreshing for only a little while before growing impertinent. The body is full and light but can’t make up for the lack of character on the taste. All good things must eventually come to an end. For instance, every night at 2 AM. Or The Riches. But in this case I mean my coverage of the 2008 holiday season. Tonight I am having the twelfth beer of X-Mas (does twelfth look strange to anyone else? 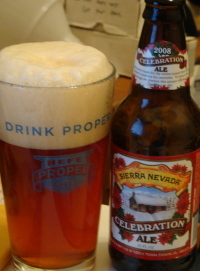 ): from Sierra Nevada Brewing in Chico, California comes their annual Christmas beer Celebration Ale. If you couldn’t tell from the picture I shook this one up a little bit on my way home. Oops. Anyway, it poured a lightly hazy deep amber, almost tawny. The head is thick and creamy, with the color and feel of champagne. The nose is strongly hoppy with floral notes of potpourri and a citric herbal aroma like lemon grass. Playful and light yet complicated, the aroma can actually stop you on your way to take a drink. The flavor is at first quite bitter, but it takes only a moment for the tongue to acclimate. Soon earthy and herbal hop flavors emerge, decorated with lemon citrus notes. A strangely light but almost cloying sweetness follows. Some malt is apparent as well: caramel and a bit of grainy flavor. The palate is thick but not too much so, the bitterness robust but not too much so, the sweetness cloying but not to much so. This beer is remarkably mild for its 6.8% legs.